Enabling secure BYOD has long been a challenge for IT. Attempts to secure these devices with agents and device management tools like MDM have been met with widespread employee concerns about privacy and usability, and as a result, organizations see low rates of adoption. Requiring that employees use these install these cumbersome device management tools or access data solely from managed devices are solutions fraught with issues. Employees need the flexibility to work from any device, anywhere. 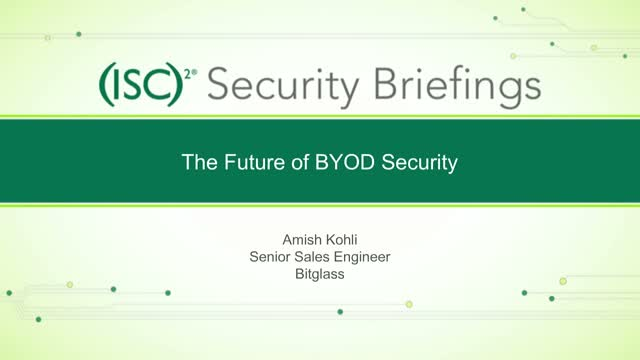 Join Bitglass and (ISC)2 for the 3rd part of our 3-part Briefings series on May 4, 2017 at 1:00PM Eastern where n this we discuss the trends driving growth in demand for BYOD, the drawbacks of MDM, and some of alternative solutions used to secure employee-owned devices without agents.